The surge of excess shielding gas occurring at every weld start is a major contributor to the gas waste. Each time the MIG gun switch is pulled, up to 6 times the physical gas hose volume (from gas supply to the wire feeder or welder) is wasted. In addition to the gas waste this surge creates a turbulent shield that pulls air into the weld zone. This moisture laden air causes inferior quality weld starts with internal weld porosity and excess weld start spatter. When welding, the gas pressure drops across the needle valve (or orifice in a flowgauge/regulator) and ranges from 3 to 7 psi in the gas delivery hose from gas source (cylinder or pipeline) to wire feeder/welder. That's all that is needed to flow 30 to 40 CFH. When in the "choked flow" or Automatic Flow Compensation mode the pressure will be whatever is needed to to have the flow rate being set in the small needle valve or orifice flow control passage, continue through the wire feeder plumbing, MIG gun cable, MIG gun and nozzle. When welding stops, gas continues to flow though the flowmeter needle valve or regulator/flowgauge into the hose and the pressure quickly raises to the regulator or pipeline pressure. That pressure ranges from 25 psi up to 80 psi. Note a minimum of 25 psi is needed to keep flow settings constant- SEE WHY. T he volume of gas extra in the gas delivery hose increases with pressure. If the Absolute Pressure increases 5 times then the gas volume increases 5 times! We found that hose expansion creates another 13% increase in gas volume but the main increase in volume is due to the pressure increase. When welding starts again the extra gas stored in the hose blasts out of the MIG gun nozzle wasting gas and pulling air into the gas stream. This moisture laden entrained air causes excess spatter and possibly internal weld porosity! The use of our recently patented Gas Saver System (GSS TM ) eliminates the excess "gas blast" at each weld start. This typically cuts the total gas use about half but some have reported even higher gas savings. One fabricator purchased our GSS and tested the amount of gas waste reduction. Their tests were made using shielding gas from cylinders for accurate measurement. With the normal gas hose and welding machine settings they welded 236 identical parts with a full cylinder. They installed our GSS replacing their gas delivery hose and with no other changes they welded 632 of the same parts with a full cylinder! All gas savings were from the reduced gas surge at the weld start. See Why the Gas Surge Exists and How the GSS Works. The WAT PTD consists of a 0 to 100 psi industrial pressure gauge with a CGA 032 "B" female fitting on one side and male CGA 032 "B" fitting on the other. 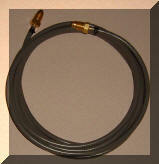 Just unscrew the gas delivery hose from the gas supply or feeder end and insert the WAT PTD. The pipeline pressure can be tested since the gas pressure in the gas delivery hose rapidly increases to the pipeline pressure when welding stops. The device can be used to quickly test pipeline pressure at the wire feeder gas inlet in several areas of the shop. Full details are provided with the Instructions that accompany the product. 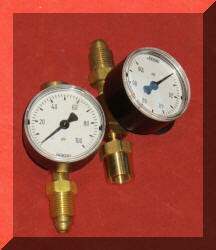 We have often found gas flowmeters with the ball pinned to the top of the flow tube. Our tests show this can be a 150 Cubic Feet per Hour (CFH) gas flow rate. Research performed to see if increased flow could improve weld quality in a 5 MPH wind environment yielded interesting results. This unpublished work showed that with a standard 5/8 inch ID MIG gun nozzle, a 45 CFH shielding gas flow rate produced less internal porosity than 65 CFH! This validates that turbulence created by the 65 CFH flow rate causes moisture laden air to be sucked into the shielding gas stream and is counter productive. Unfortunately many welders and other folks involved in welding think "if some shielding gas is good more must be better." Believe reducing system gas pressure helps, not understanding that this approach creates more problems by eliminating Automatic Flow Compensation built into MIG gas delivery systems since the process was invented! When discussing our GSS with an engineer at a plant making highway trailers he said his gas supplier just checked their flow rates and the 100 CFH set by flow control orifices at their pipeline gas drops was fine! Their gas supplier should have read the article published by the Manager of Welding R&D for the largest shielding gas producer, Praxair! CLICK to see why he says in excess of 50 CFH GAS FLOW causes weld quality problems! THE SOLUTION TO HIGH FLOW SETTINGS: If you’re using flowmeters on cylinders or on a pipeline gas supply a patented lock (photo right) is available that allows the maximum flow rate to be set and locked. See Details. Third Reason for Gas Waste: LEAKS. We have found leaks are often subjectively viewed as the cause of all gas waste. That is an easy excuse for a gas supplier to make when purchasing finds gas use is far more than calculations show how much should be used (Click to See A Way to Determine How Much Gas You Should Use.) We have also found leaks are frequently not as significant a cause of waste as initial gas surge and excess flow settings. However leaks are easy to detect and fix and should not be tolerated. Another reason to fix leaks is their effect on weld quality. When gas is leaking out of a pipeline, hose or fitting; moisture laden air is leaking back through the passage that caused the leak! THE SOLUTION TO MANAGING LEAKS: Click to see our home study training programs that define problems related to leaks and how to correct them. It also identifies ways to have lead welders, welding foreman etc, measure and plot gas versus wire use that will help detect leaks. Also discussed is the reason moisture and air flow back through a hole where gas is leaking out! On Average Each MIG Welder Wastes ~8 Tons Shielding Gas/ Year. Standifer, L. R., Shielding Gas Consumption Efficiency. The Fabricator, Volume 30, Number 6, June 2000. Lyttle, K. and Stapon, G., Simplifying Shielding Gas Selection. Practical Welding Today, Vol. 9, No. 1, Jan/Feb 2005. Free Technical Paper, "MIG SHIELDING GAS CONTROL"